Well, when she mentioned the Nomandie Village, I knew exactly what she was referring to – a jumble of peaked-roof French Provincial apartments that at one time drove up its chimneys and shingles from the cascading hillside on the Sunset Strip. I couldn’t find any real photographs of the Normandie, which stood at 8474 Sunset Boulevard, but discovered that a fire did occur there in 1955. 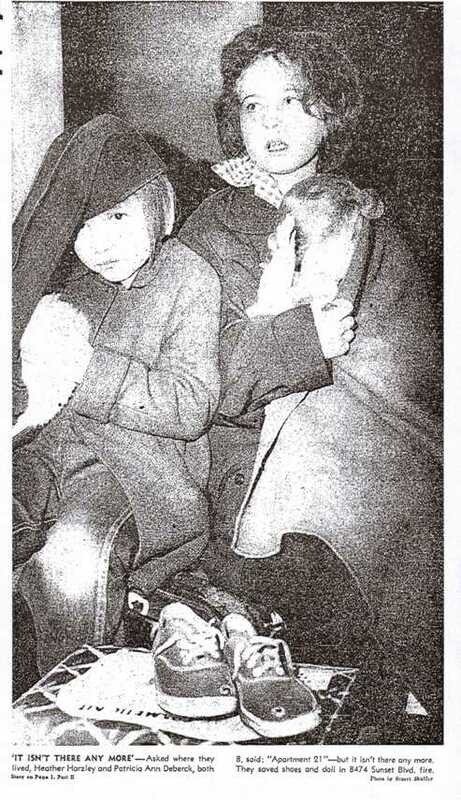 And there along with the story, just as she said, was a photo of two little girls – and one of them was named Patricia. Built in the 1920s, the Normandie Village competed with the Garden of Allah, farther east on the strip, for Hollywood-type history. In the apartments clustered amid vine-covered pathways that made the Normandie Village resemble medieval suburbia of Marseilles or Toulon, great stars of silent movies and the new “talkies” lived, partied and nervously waited out “between pictures” idleness. There are many stories that circulated about the Normandie but no one can know for sure if some of them are true. One story claims that actor John Barrymore sent an architect to Europe to study French Provincial architecture and that he designed the Normandie Village’s high-peaked buildings as replicas of what he saw on his tour. Over the years, the Normandie was home to many film stars. Edgar Rice Burroughs, creator of Tarzan, did his last writing at the Village. Richard Dix, an aspiring young actor, checked in there about 1924 when he arrived from New York to seek employment in films. Myrna Loy and Billie Dove, two of the Hollywood’s film queens, lived there. Jimmy Stewart once recalled in a Saturday Evening Post story how he and Henry Fonda lived at the Normandie Village in their early Hollywood days. Not only was the Village the scene of some Babylonian bashes, but nearby, according to unofficial history, Charlie Chaplin had a private “key club” for close friends. The fire that Patricia referred to coincidentally occurred in the early morning hours of January 4, 1955 – 56 years ago tomorrow! A cigarette burning in the upholstery of a garaged car was blamed for the fire that destroyed the garage, ten parked cars and 24 of the 55-units of the Sunset Strip apartment building. 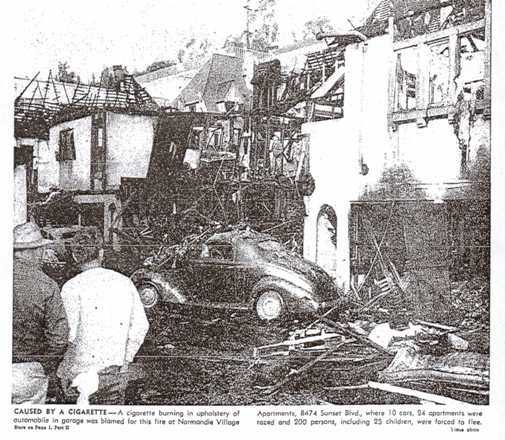 The fire ravaged the rear half of the Normandie, but all the tenants, including about 25 children, escaped the fires without injury. Of those 25 children, were Heather Harzley and Patricia Ann Deberck. Like the other children who had escaped, they clutched their most prized belongings. Someone asked Patricia Ann where she lived. “We lived in Apartment 21,” she said somberly, “but it isn’t there anymore.” The following photo appeared in the Los Angeles Times, just as Patricia remembered. 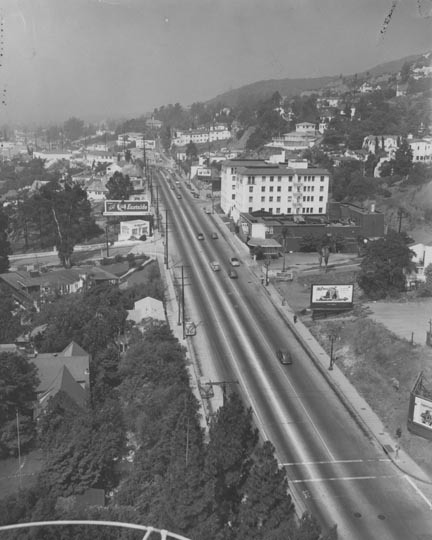 The Normandie Village was inhabited for another seven years until it was sold in 1962 to make way for a proposed 22-story hotel to be called the Hollywood Thunderbird. However, the hotel never happened and the Normandie stood vacant for another eight years until it was finally razed for the Sunset Americana, a residential hotel which was built in 1973. I haven’t had a chance to check out the sight currently, but a trip to Google Maps once again shows a vacant lot at the address (8474 Sunset Blvd.). A group of alumni and students unveil a bronze, and vandalism-resistant, re-creation of the famed lawn sculpture of alumna Myrna Loy before she rose to fame as a leading actress of the ’30s and ’40s. Venice High School welcomed back some Old Hollywood royalty Saturday as hundreds gathered for the unveiling of a new statue of alumna and movie star Myrna Loy. The bronze work is a re-creation of the beloved concrete sculpture of Loy that graced the front lawn of Venice High for more than seven decades but suffered years of corrosion and vandalism. Tobacco firms paid huge amounts for endorsements from the stars of Hollywood’s “Golden Age”. Industry documents released following anti-smoking lawsuits reveal the extent of the relationship between tobacco and movie studios. One firm paid more than $3m in today’s money in one year to stars. Researchers writing in the Tobacco Control journal said “classic” films of the 1930s, 1940s and 1950s still helped promote smoking today. Virtually all of the biggest names of the 1930s, 1940s and 1950s were involved in paid cigarette promotion, according to the University of California at San Francisco researchers. They obtained endorsement contracts signed at the times to help them calculate just how much money was involved. Actress Myrna Loy is little known by today’s students, but others want to return history to the campus. Movie star Myrna Loy has passed from legend to relic status on the Venice High campus.